A gift deed, or deed of gift, is a legal document voluntarily transferring title to real property from one party (the grantor or donor) to another (the grantee or donee). A gift deed typically transfers real property between family or close friends. Gift deeds are also used to donate to a non-profit organization or charity. The deed serves as proof that the transfer is indeed a gift and without consideration (any conditions or form of compensation). Valid deeds must meet the following requirements: The grantor must intend to make a present gift of the property, the grantor must deliver the property to the grantee, and the grantee must accept the gift. Gift deeds must contain language that explicitly states no consideration is expected or required, because any ambiguity or reference to consideration can make the deed contestable in court. A promise to transfer ownership in the future is not a gift, and any deed that does not immediately transfer the interest in the property, or meet any of the aforementioned requirements, can be revoked . A lawful gift deed must also include the grantor's full name and marital status, as well as the grantee's full name, marital status, mailing address, and vesting. Vesting describes how the grantee holds title to the property. are tenancy in common, joint tenancy, and community property. A grant of ownership of real estate to two or more persons is presumed to create a tenancy in common, unless otherwise stated in the conveyance. A married couple may hold real property as joint tenants, tenants in common, or as community property. (NRS 111.060-.065; 123.220; 123.030). All property acquired after marriage by either spouse, or both, is community property unless the property was acquired by gift. Gifts can only vest as community property when made to both spouses (NRS 123.130). As with any conveyance of real estate, a gift deed requires a complete legal description of the parcel. Recite the source of title to establish a clear chain of title, and detail any restrictions associated with the property. A Declaration of Value form must accompany all real property documents. If an exemption to the transfer tax is claimed, it should be noted on the Declaration of Value (NRS 375.060). See NRS 375.090 for a list of exemptions. Record the completed deed at the local County Register of Deed's office. The IRS levies a Federal Gift Tax on any transfer of property from one individual to another with no consideration, or consideration that is less than the full market value. 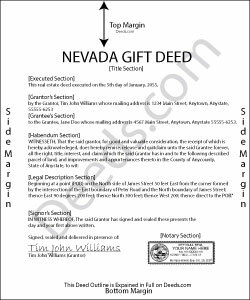 Gifts of real property in Nevada are subject to this federal gift tax, but there is no associated state gift tax. In accordance with federal law, individuals are permitted an annual exclusion of $14,000 on gifts. This means that gifts valued below $14,000 do not require a federal gift tax return (Form 709). Even so, grantors should consider filing one for many gifts of real property . The grantor is responsible for paying the federal gift tax; however, if the grantor does not pay the gift tax, the grantee will be held liable . With gifts of real property, the recipient of the gift (grantee) is not required to declare the amount of the gift as income, but if the property accrues income after the transaction, the recipient is responsible for paying the requisite state and federal income taxes . This article is provided for informational purposes only and is not a substitute for the advice of an attorney. Contact a lawyer with any questions about gift deeds or other issues related to the transfer of real property. For questions regarding federal and state tax laws, consult a tax specialist. STANLEY F. said: Forms were spot on and able to save over $100 by not going to an attorney to complete the same documents. There were templates on how forms are supposed to be completed. You just need a notary to sign. Reply from Staff: Thank you Stanley, we really appreciate your feedback. Mary P. said: Excellent easy to follow instructions. Reply from Staff: Great to hear Mary, Have a wonderful day! daniel b. said: nice & easy, site needs to have notification as to security of credit card info. who and how? crystal l. said: Another legal professional directed me to this site. The best advice I've received from the legal profession! Forms were instantly available, easily printed & exactly what I needed at a cost that was more than affordable!! I will definitely be back again!! Reply from Staff: Thank you Crystal and please thank your associate for us. Have a fantastic day!